Tuesday, March 13, 2007. It's a day that will live forever in Pittsburgh sports history. 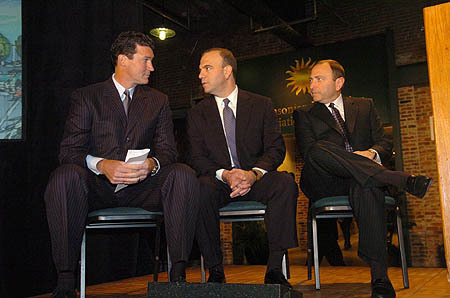 It's the day that Mario Lemieux, Ron Burkle, Ed Rendell, Dan Onorato, Luke Ravenstahl, and Gary Bettman ended years of uncertainty about the Penguins' future in Pittsburgh with the announcement of a plan for a new arena. And it's the day the Penguins also happened to be facing off with the top team in the Eastern Conference. The Buffalo Sabres rode into town with hordes of fans, a 44-19-5 record, and a three-game losing streak. A few hours later, the Sabres rode out of town with hordes of disappointed fans, a 44-19-6 record, and a four-game losing streak. Today was a day when the Penguins would not be denied, on the ice or off. Despite blowing yet another lead, this of the two-goal variety, the Penguins got their wish and forced the game into a shootout, ultimately winning by a count of 5-4. As the Pens held on to a 4-3 lead late in regulation, Buffalo pulled goalie Ryan Miller in exchange for an extra attacker. The Penguins quickly moved the puck down the ice and towards the empty net, but Mark Recchi's shot hit the post. Then Ryan Malone was unable to score into a net manned only by a defenseman. At that point, I told my brother, "I hope this isn't one of those situations where a team misses the empty net and it comes back to haunt them". Sure enough, former Little League World Series hero Chris Drury scored with 6.2 seconds to go, forcing the overtime and shootout sequences that the Pens love so much. Erik Christensen kicked his extra point past the goalie for the first goal, giving the Pens a 1-0 edge. Marc-Andre Fleury stoned Daniel Briere, then Jarkko Ruutu was stopped by Miller, keeping the 1-0 count intact. Drew Stafford was able to get one past MAF to tie things at one; but then the clock hit "Crosby", and Crosby Time went just as planned. What better way to end a day of Penguin hysteria than a Sidney Crosby shootout goal? Fleury ended the contest with a stop of Buffalo's Thomas Vanek, and happy times were had by all (who didn't drive down from Buffalo). Pens win, Pens win. So the Pens have a new arena, another shootout win in the books, and two more points. But everyone must regain their focus quickly, as the team travels to New Jersey for another meeting with the Devils on Wednesday night. --"At the end of the day" is the official cliche of 2007. I didn't take an official count while watching the 5 PM press conference, but it was uttered over...and over...and over...and over. It's a Lemieux favorite. He even managed to squeeze one in an intermission interview with OLN's Jack Edwards. --I missed the presence of Georges Laraque tonight. I thought he might be injured from Colton Orr ramming his head into Laraque's fist on Saturday, but it was back spasms. Get well soon, BGL. --That Quizno's commercial where the woman talks about real women wanting meat...disturbing. --The pregame PA address was Vintage Lemieux. Brief, to the point, and well-said. As one of the biggest Mario fans on the planet, it was a chilling moment. --I'm looking forward to a new arena, but to be honest, I'm really going to miss the old Civic/Mellon Arena. I experienced a lot of exciting times in the building, including countless playoff games, sitting five rows behind the net for Sid's first-ever shootout goal last year, having Mario hold his elevator to sign my jersey as a kid, and getting put in a headlock by Gordie Howe at the 1990 All-Star Game. Of course, I'll also remember the disappointing moments I was in the stands for, including the 5-OT loss to the Flyers in 2000 and the 1996 Game 7 loss to the "rats" Panthers team in the Eastern Conference Finals. --OLN did a decent job with the broadcast, but I missed the local Fox coverage on such a special day in team history. --My final word on the arena: lots of feelings were hurt, many accusations were made, but somehow these two sides came together in lieu of the IOC plan to make a deal. Congratulations to both sides, because you made the fans the big winners for at least 30 more years. Video: KDKA's Andy Sheehan reports. KDKA's John Shumway has fan reaction. First row, second from right...."
I don't know if it's her or not. We're going to need some intervention from the readers here. But there's one thing I CAN say with certainty: at the end of the day, staying in Pittsburgh will undoubtedly make some Penguins very happy. Congrats on keeping your team! The earlier picture of GwenJen did not do her justice. If she's up to it I think Mondesi should do a first-ever Penguin groupie photo spread of GwenJen. As the music goes, "Bow chick a wa waaaa"
Those pictures look more airbrushed out and "fixed up" than the other ones. In fact, I don't think it's her because it doesn't look much like the chick in the other ones at all. I still believe that GwenJen was the deciding factor in the Penguins staying in Pittsburgh.